This incredibly delicious Traditional Venezuelan "Pan de Jamon" is a MUST-HAVE on your holiday table! 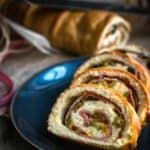 Tender and tasty bread dough filled with ham, olives, and raisins, this showstopper bread will WOW your guests. Line a baking tray with lightly greased parchment paper. Place warm milk, water, sugar, in a small mixing cup and mix to dissolve sugar. Add yeast and stir until completely dissolved. Let mixture stand until yeast begins to foam vigorously, about 5 – 10 minutes. Add flour and salt into the bowl of a stand mixer fitted with the hook (bread paddle) attachment. Make a well in the center and add the yeast mixture, egg and butter to the well; mix on medium speed until incorporated. Increase the speed to medium-high and mix until the dough forms a ball and pulls away from the sides of the bowl, about 8 - 10 minutes. The dough should be elastic but not sticky, if too sticky add a little more flour, about a tablespoon at the time. Place the dough on a lightly floured surface and form a ball. Place the dough in a lightly greased bowl, cover, and let it rise for 60 minutes until it's nearly doubled in bulk. Then, place the dough on a lightly floured surface and roll it into r 15"L x 13"W rectangle, about ½ inch thick. Arrange a row of whole olives on the upper edge. Slice the rest of the olives. Line the dough with the ham slices, slightly overlapping each piece and covering the entire surface of the dough. Sprinkle the raisins and sliced olives on top of the ham, scattering them evenly throughout. Drizzle with papelon syrup, if using. Firmly roll it up like a Swiss roll. Transfer the roll, seam-side down, to the prepared baking sheet. Put a warm damp towel, loosely on top of the bread, place it in a warm and humid area in your kitchen and let it sit for 60 minutes. Brush bread with egg wash for all sides. Bake for 40 – 45 minutes, or until golden brown. Remove the bread from the oven, and while is still hot brush with melted butter. Let the bread cool for 15 – 20 minutes before serving. You can substitute 1 regular egg for 1 flax egg. Just mix 1 tablespoon golden flax meal and 3 tablespoons cold water. Let it rest for 10 minutes. EGGLESS EGG WASH: You cannot consume eggs? No problem! Just combine ¼ cup whole milk and 1 tablespoon of maple syrup. Use when the recipe calls for egg wash.
PAPELON SYRUP: Papelon, also known as piloncillo, panela, or rapadura, is unprocessed cane sugar sold in hard, flat discs or cones. You can find it in most grocery stores (international aisle) or online. To make papelon syrup combine in a small saucepan 3/4 cup sheered papelon and 2 tablespoon water, mix and let it simmer over medium heat until thickens. If papelon is not available, you can use 2-3 tablespoons of molasses. TIP TO ACTIVATE YEAST: To activate the yeast properly the liquid temperature must be at 110°F-115°F. If the water is too cold, the yeast will not "wake up." If the water is too hot, it may kill the yeast. Using a thermometer is the most accurate way to determine the correct liquid temperature. However, if a thermometer is not available, you can test the water with your finger. Water at just above the 100-degree mark will stop feeling cool to the touch and will feel comfortably warm – but not burning. HOW TO MAKE EGGLESS EGG WASH? Just combine ¼ cup whole milk and 1 tablespoon of maple syrup. MAKE AHEAD: This dough can be made ahead of time. Just make the dough, wrap with plastic wrap and refrigerate up to 24 hours. Then remove from the refrigerator and follow the recipe from step 4. When I have short of time, I use store-bought dough. The brand I like is Bridgford Frozen White Ready-Dough. It comes in a red plastic bag (with 3 loaves) and It can be found in the frozen product aisle. For better results preheat the oven for at least 20 - 30 minutes before baking the bread.